They should have been in Los Angeles a lot earlier had it not been for the “US government shut down” brought about by bitter political bickering between US President Donald Trump and the Democrats in Congress partly over some barrier wall planned to separate the US and Mexico. But they are finally in town, and that’s all that matters. Yesterday welterweight contender, Jayar Inson and flyweight Genisis Libranza of the Nonoy Neri Boxing Stable in Davao City, finally arrived at Los Angeles after getting all their paper work straighten out when the US Embassy in Manila finally re-opened for business. Inson and Genisis Libranza make their U.S. debuts on the big stage as part of the non-televised undercard headlined by their fellow Filipino countryman Manny Pacquiao on Saturday, January 19 at the MGM Grand Garden Arena in Las Vegas. Inson (18-1-0, 12 KOs) will battle in an eight-round welterweight match, while Libranza (17-1, 0, 10 KOs) takes on Nicaragua's Carlos Buitrago (30-4-1, 17 KOs) in an eight-round flyweight match as the two fighters from Davao City, Philippines look to continue their respective win streaks alive. Inson is riding on five straight wins that included 3 TKO’s, 1 Unanimous Decision and 1 majority decision dating back in Sept 2017. His latest win was a TKO over Allan Tanada at Butuan City last October 2018. Libranza on the other hand. is on a six straight winning streak dating back in July 2018. His latest win was a TKO over Renz Rosia at Butuan City last October 2018. Libranza will battle Nicaragua’s Carlos Buitrago (30-4-1,17KO) Buitrago is best remembered by Filipino boxing fans through his fight ex-WBO minimumweight champion Merlito Sabillo that ended in a split draw back in November 2013. This morning, accompanied by Coach Ting Arriosa, an assistant on the Team Pacquiao, Inson and Libranza visited our offices to be fitted custom-made mouthguards. The mouthguards were designed and fabricated per the request of Filipino boxing legend, Manny Pacquiao who insist on Filipino fighters on the undercard be properly protected. “Gawan mo sila nang magandang mouthguard,” (Make them good mouthguards). Gusto ko ikaw na rin ang cutman nila (I also want you to be their cutman) were the marching order given by the Fighting Senator to this writer. Pacquiao incidentally will be using a new mouthguard for the fight specially designed for him to be very well protected against a rugged fighter, Adrien Broner. Inson and Libranza thus join some of the most elite and very smart fighters that climbed the ring wearing MouthGuardsForChampions. 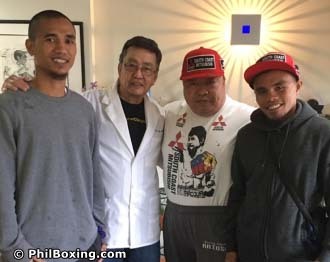 The other Filipino fighter Jhack Tempora who recently arrived from Manila to fight on the undercard was a no show in spite of his handlers being advised to bring him to our offices. It appears he has pressing issues that are more important than getting a well fitted custom mouthguard.